Back to a nice yarn giveaway today!! 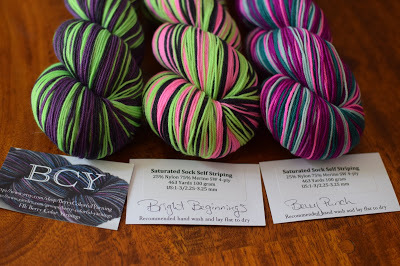 Susan B. Anderson is giving away a skein of Berry Colorful Yarnings self striping yarn. You get to choose from the three shown! I personally would go with the Hulk colorway! Click here to enter the Berry Colorful Yarnings Sock Yarn Giveaway! Good luck as always, and tell us what colorway would you choose? Share the post "Berry Colorful Yarnings Sock Yarn Giveaway!"